These days I feel like the Internet is littered with essays and blog posts and articles telling us why we, the Church, are dying, why we're failing, and listing all the corrections we can make to entice people back into our cobwebbed pews. These posts are always addressed AT the Church, like the people writing them are outsiders or bystanders even, simply impartial observers with a few constructive notes. But that's rarely the case, these posts almost always come from people on the inside. Sometimes the author is hurt, sometimes they're angry, sometimes they’re just disappointed. They acknowledge their desperation and frustration and anger but rarely do they acknowledge that they are part of the problem, because here’s the thing: anything addressed AT the Church from someone INSIDE the Church is self-addressed. 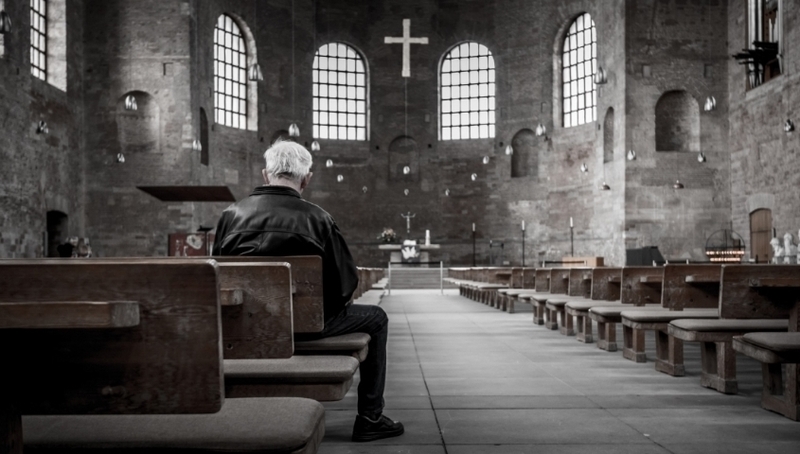 The people responsible for making a Church what it “should be” are the people in the pews; the people with the most impact on what a Church does is those of us sitting inside it. We are the Church and it is what we make it. If she is broken it's because we are broken, if she is failing it's because we are failing. So often we forget our responsibility to mold the Church into the missional, living thing it’s meant to be. We’re content to sit and be fed by the worship or be served by the ministries. We get frustrated at the problems like they are things being done to us instead of things we have an active part in. Often times we walk away, complaining about the flaws as we go, saying we’re off to find another Church body that is able to be what we want it to be, what we need it to be. Either way it makes us takers, demanding our way and using up the Church’s resources without contributing. The takers hold the Church hostage. Too often the Church puts too much into retaining the takers with no payout. The Church becomes entrenched in trying to make the takers happy, trying to keep people. The Church becomes attractional. It happens because we need people, the Church becomes attractional because we can't do kingdom work without people. It takes people to man a food pantry, to build homes for the homeless, to mentor kids and fight injustice. It takes people to move the family who just lost their house or take meals to the people incapable of leaving the home. The Church becomes attractional because the Church is powered by people and without people it breaks down. The people of the Church shape and propel it. What the Church is, what it looks like, what it does isn’t on the senior pastor or the elders, or the steering committee or anyone else. What the Church is and looks like and does is on each and every one of us. And the more we balk at what the Church is not, the angrier we get that it doesn’t meet our needs, the more we blame shift and shame the Church for not being what we want it to be, the less energy is being put into building a healthy, impactful Kingdom Church and the more energy is put into getting and keeping people. We are all guilty of being takers at times, of being loud with our dissatisfaction at what the Church is or isn’t. We are all guilty of taking part in the throwing of stones but no part in the building of the Kingdom. We miss the essential truth that if we are not invested relationally, attending regularly and serving faithfully then we will never be satisfied regardless of what the Church looks like or does. The Church doesn’t need to fit your preferred worship style, liturgical content quota or exact political ideals to be effective or impactful. You are never going to agree with the Church 100% of the time in 100% of everything. It’s services, style, ministry philosophy, mission statements, and ministries are never going to be what everyone wants all of the time. Christians have been having this conversation literally since the beginning, meat or no meat, circumcision or no circumcision, the old way or the new way. All we've accomplished in that time is division and disunity while the world around us watches and wonders how we could possibly represent who we say we represent. We have torn each other apart over minutia and inference while the world winds it’s way through darkness. We're so busy arguing over who's worshipping the right way that we lose the point of worship. We’re so worried over who has the best answer to the current issues that we’re forgetting to give answers to anyone. We’re so busy determining how people are sinning that we’ve lost sight of how people are suffering.This isn’t some faceless entity we can write open letters to and rail at, this is US. We are the Church that is doing these things and we're no better than the disciples arguing over who is the greatest during the last supper. We have got to stop blaming the Church for dropping the ball because WE ARE THE CHURCH. Until we have given her every single thing we’ve got we have no room to throw stones at her. We have to pray for guidance, pray for openness, pray that the Lord would change our hearts, pray for our leaders, pray for a burden, invest in our faith community, be committed to serving in a ministry, take responsibility for our worship experience, seek out the needs and fill them. To be part of the Church as we want it to be we have to keep trying, keep putting in, keep building it brick by brick. It can be slow and painful and inconvenient but it is the stuff of the Kingdom of God. And if we don’t do it we have no one to blame but ourselves when we turn around and wonder why it’s not done. We are the Church, and it is what we make it. You are your church, and it is what you make it.